Background: Malocclusion is the third dental public health problem by the World Health Organization. A classification of the patient's occlusal traits should be performed to group them for better information management and to facilitate communication between specialists. Purpose: The aim of this study was to compare knowledge on classification systems of existing malocclusions among dentists and orthodontists. Materials and Methods: This research was a cross-sectional study. A sample size of 239 general dental practitioners and 111 orthodontists was surveyed. Inclusion criteria were at least 1 year of work experience and location in the metropolitan area of Medellín. Individuals who were teachers were excluded. The questionnaire consisted of photographs of side and front dental study models of five patients in orthodontic clinic. Practitioners were asked to indicate both a diagnosis and the classification system used for their diagnosis. The percentage of correct answers provided was calculated for each stratified case by orthodontists and dentists and by the college from which they had graduated. Results: Of a total of 831 questionnaires distributed, 350 were filled out and returned. Most practitioners were diagnosed only in the sagittal plane, and 100% of responses used Angle's classification. Vertical and transverse planes were considered when the occlusion alteration was highly pronounced. The percentage of correct answers was similar among universities. Conclusion: Classification systems of existing malocclusions do not provide the dentist or the orthodontist with appropriate occlusal diagnosis unless alterations are evident. When dealing with a patient, it is necessary to determine the type of malocclusion as well as the expected treatment difficulty level according to the diagnosis, to discriminate between diseases or deformities and to distinguish them by their characteristic signs and symptoms. As part of that process, a classification of the patient's occlusal traits should be performed to group them into classes, divisions, and subdivisions for better information management and to facilitate communication between specialists. Thus, in the literature, several authors are found who, in an effort to classify the occlusal aspects of their patients, have designed their own malocclusion classification system. Some of them were Carabelli, Kingsley, Angle, Case, Bennett, Dewey, Anderson, Simon, Ackerman and Proffit, Katz, among others.,,,,,, In addition, published reviews of these classifications can be found by Roth, Graber, Proffit, Ricketts, and Andrews. These papers recommend to reexamine the classification developed by Angle, the most widely used classification system (adopted even by American Board of Orthodontics) until now since it shows some shortcomings, resulting from not taking into account the vertical and transverse planes or abnormalities of the bone bases., Malocclusion classification has traditionally taking to account the sagittal plane relationship to determine the overall diagnosis; nonetheless, other classification systems consider the vertical and transversal planes to obtain a more accurate diagnosis., Molar relationship in the sagittal plane is the basic item to determine sagittal diagnoses; however, the canine relationship is important too. A malocclusion is the result of a variety of combinations in the three planes: sagittal, vertical, and transversal. In some cases, the transverse plane can alter the sagittal perception during the assessment, leading to an inaccurate diagnosis. Based on the above, the aim of this study was to compare the knowledge general dental professionals and orthodontists have on the classification systems of existing malocclusions. This study was approved by the Ethics Committee of the Universidad Cooperativa de Colombia. The procedures followed were in accordance with the ethical requirements provided by Resolution 8430 of 1993, issued by the Ministry of Health. 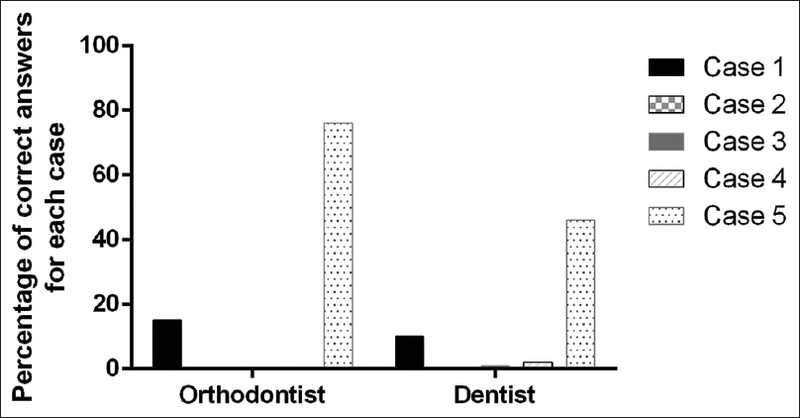 Before determining sample size and sample collection, standardization of the data collection instrument was carried out, which involved a questionnaire with eleven questions concerning photographs of side and front dental study models of five patients from an orthodontic clinic [Figure 1] and [Table 1]. The malocclusions showed on the questionnaire have different types of sagittal, vertical, and transverse relationships to estimate the influence of the variety of occlusal interdigitation in establishing the proper diagnosis. 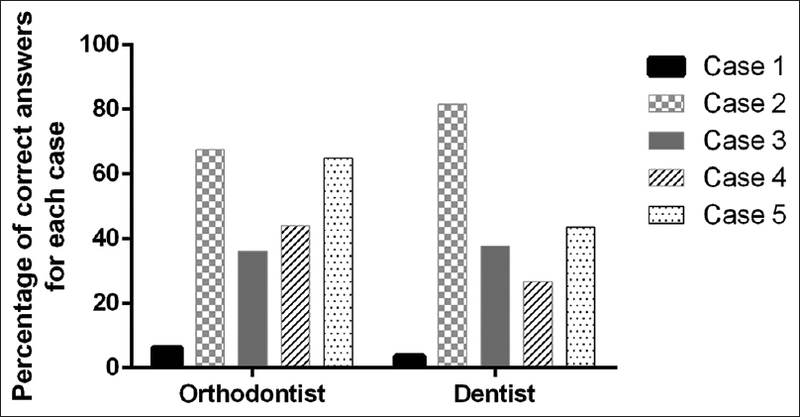 To estimate the sample size, we took the percentage of use of sagittal, vertical, and transverse planes that dentists and orthodontists use to establish the diagnosis of malocclusion. For that reason, we did a pilot study with 10 dentists and 10 orthodontists. We found that dentists use the sagittal plane in 100% of cases to diagnose a malocclusion; vertical plane is used in 30% of cases, and the transverse plane in 20% of cases. Orthodontists use the sagittal plane in 100% of cases, the vertical plane in 50%, and the transverse plane in 40%. To calculate the sample size, the lowest percentages were taken, for both dentists and orthodontists, of the planes they use to classify a malocclusion since this approach yields the largest sample. According to the information obtained from three universities of the Metropolitan Area of Medellín, a total population of 8,000 graduated dentists and 156 orthodontists was estimated, with a confidence of 95% and an estimate accuracy of 5%; it was calculated that 239 dentists and 111 orthodontists were to be surveyed. Inclusion criteria – Dentists and orthodontists located in the metropolitan area of Medellin, Colombia, with at least one year of work experience and who agreed to participate in the research study. Exclusion criterion – Dentists and orthodontists who were teachers. Authorization was requested from each institution and professional to allow visits to the work site and to fill out the data collection form in situ. Each of them was informed about the study characteristics as well as its professional impact. The poll questionnaire was conducted anonymously in the institution premises, private offices, and/or selected dental clinics. 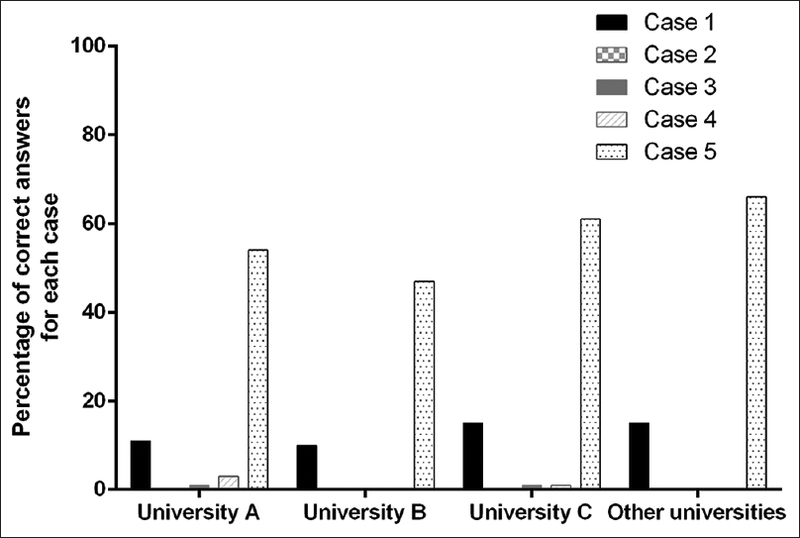 All respondents were presented with a survey [Table 1] and a format containing the photographs [Figure 1]. 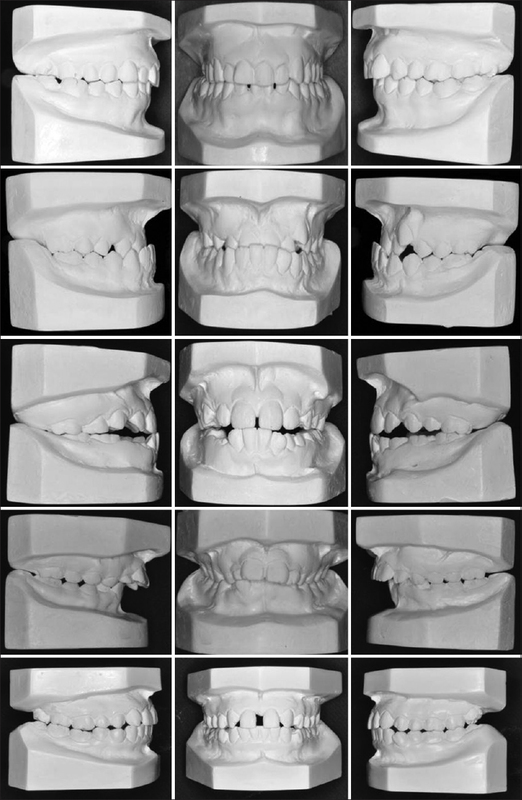 Based on these pictures, each practitioner was asked to answer eleven questions concerning the type of malocclusion observed for the five dental models, using the sagittal, transverse, and vertical space plane as a reference, as well as the classification system employed for each case. One of the researchers went to the dentists' offices and dental clinics every week, from Monday to Friday, to collect the survey data and required information. The information collected was accessed immediately in the database. This research was considered safe under the provisions of Resolution 8430 of 1993 of the Ministry of Health of Colombia, and therefore, informed consent was not required. Relative and absolute frequencies were calculated to describe the sociodemographic characteristics, the work place and the institution where the practitioners graduated, the plane used as a reference to diagnose the malocclusion, and other known classification systems for diagnosis. The percentage of correct answers for each case was calculated, according to the diagnosis provided by each practitioner. To establish whether there is a difference between dentists and orthodontists in terms of the classification of malocclusion and the planes used as a reference for it, the Chi-square test of independence was used. This analysis was stratified by the university from which the practitioners had graduated. P < 0.05 was considered statistically significant. Data processing and information analysis were performed using SPSS® version 18.0 (SPSS Inc., Chicago, IL, USA) (Statistical Package for the Social Sciences). The graphics were done using GraphPad Prism® version 6.01. We collected 350 questionnaires that were fully filled out. 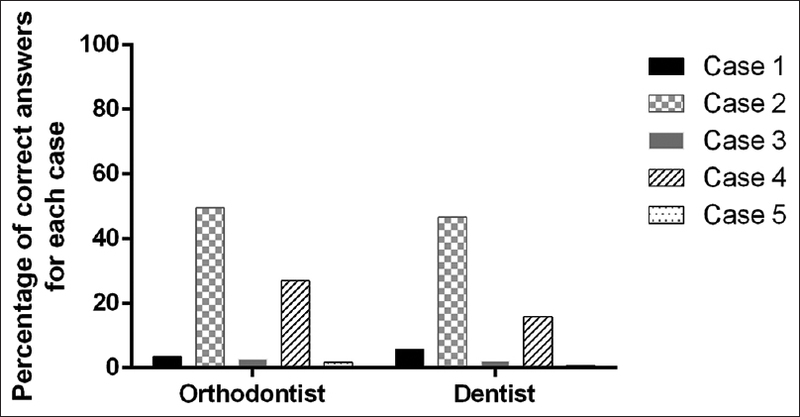 This figure corresponds to the number of questionnaires required for dentists and orthodontists according to the sample size defined. [Table 2] describes frequency of the practitioners surveyed distributed by universities. The sagittal plane obtained the highest number of responses both from dentists and orthodontists since in all cases, they tried to provide a classification based on Angle's system. However, according to the data obtained, the percentage of correct answers varied for each case. For case 1, the percentage of correct answers among orthodontists and dentists was below 10%; for cases 3 and 4, the percentage of correct answers was <40% and 50%, respectively. 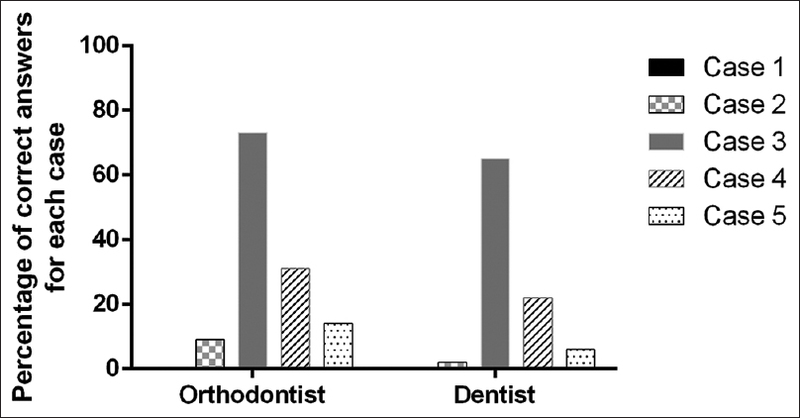 For cases 2 and 5, the percentage of correct answers was higher than 50%, except in case 5 for dentists [Figure 2]. Overjet is an important feature to supplement the sagittal-based diagnosis; however, the percentage of responses in which its description was taken into account was very low. Only in cases 2 and 4, where overjet was very evident, a description of this plane was provided as an integral part of a sagittal occlusal diagnosis, while for the rest, its description rate was below 6% [Figure 3]. Regarding the vertical plane, for case 1, responses describing the overbite were not obtained; perhaps because in this case, the vertical plane was unproblematic. As shown in [Figure 4], case 3 yielded the highest number of correct answers, and for this case, overbite was described as an important feature in occlusal diagnosis by respondents since an edge-to-edge relation was observed on the vertical plane. In the transverse plane, this classification was taken into account to describe the transverse characteristics of cases 1 and 5, which exhibit a pronounced involvement in this space plane. However, its description rate was below 5% in all other cases presented [Figure 5]. For the 5 cases, there were no statistically significant differences between orthodontists and dentists. When asked about which classification system of malocclusions was used to give the answers for each case presented, 100% of respondents answered they had used Angle's system. When asked if they were aware of an alternative classification system used to base their diagnosis, 49 people responded affirmatively. The most common option mentioned was the system by Ackerman and Proffit, followed by the system developed by Andrews [Table 3]. 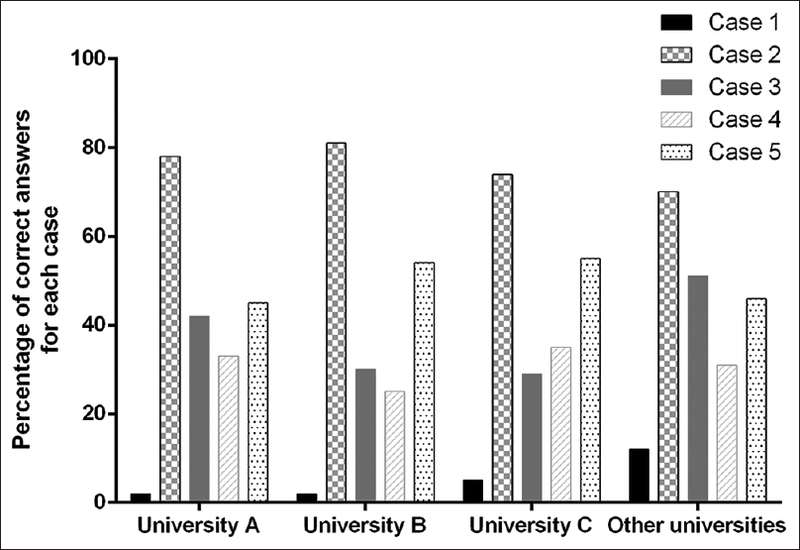 When comparing the percentage of correct answers for each case, by universities, and taking into account the three planes of space, no significant differences were obtained between practitioners graduated from different institutions [Figure 6], [Figure 7], [Figure 8]. The present study found that Angle's classification is the most widely used to determine occlusion types. However, most of respondents did not use it properly. Furthermore, the three planes of space were not considered for all patients. In orthodontics, malocclusion classification plays a very important role for several reasons. First, it helps in the diagnosis and the patient's treatment plan, providing the clinician guidance on the extent of the problem and on possible mechanical solutions. Second, because the classification facilitates communication among specialists reducing the possibility of misinterpretation., In dentistry and orthodontics, a consistent occlusal diagnosis is paramount because the practitioner needs a consistent model, clearly defined by parameters, enabling a clear and accurate classification of a malocclusion. Third, no practitioner seems to have difficulties in diagnosing a malocclusion when it exhibits very prominent features in any of the three planes. However, for a malocclusion where different characteristics coexist, a single clear diagnosis is difficult to provide. This is illustrated by the fact that no practitioner has any problem in diagnosing a true Class II or Class III malocclusion, as opposed to a Class I malocclusion, whose diagnosis becomes confusing. In the area of health care and particularly in orthodontics, diagnosis has been defined as “the art of discriminating between diseases or deformities, and distinguishing them by their characteristic signs and symptoms.” In broad terms, occlusal diagnosis in orthodontics is determined based on morphological features as opposed to etiological features. For this, a list of existing problems is defined for the patient, which is subsequently to be intervened. This situation leads to different types of malocclusion classifications and consequent errors when applied. This was evident in this study. Although 100% of the sagittal-based classifications were based on Angle's system, ignorance on its application and failure to obtain an accurate classification of any given malocclusion, based on molar and canine relationships only, were evident. These findings add to a study conducted by Katz in 1992, which found that Angle's classification, accepted for over 100 years in the field, is highly limited and unspecific. Validity and relevance of Angle's classification are not only questioned currently. Through history, a variety of critics to this classification can be found. One of the harshest was Calvin Case Calvin Case, Ackerman and Proffit in 1969, who noted that the method ignored (both for the treatment plan and the diagnosis) the tooth-facial relationship. Another criticism made by Case in Ackerman and Proffit, and later taken up by Graber and Swain Graber and Swain, Du SQ et al, was that despite that malocclusion is a three-dimensional problem, in Angle's system, only deviations in the anteroposterior plane are considered. In addition, in this method, a variety of features present in different malocclusions are not recognized, which share the same distomesial occlusal relationships. This study found that clinicians rely on Angle's molar classification for sagittal-based diagnosis. However, it is evident that many dental occlusions may be difficult to classify in this plane when taking into account solely the molar ratio, given the characteristics of each, such as Bolton's discrepancies, or the loss or absence of a first permanent molar. Case 1 is a good example since it exhibits a sagittal asymmetry in dental arches leading to a Class II left subdivision malocclusion in Angle's system. This type of asymmetrical relations makes sagittal-based classification difficult, and this is evidenced by the low percentage of correct answers obtained in the study, showing that when it comes to a more specific or elaborate classification, the practitioners tend to ignore Angle's guidelines. It is not enough to be familiar with the concept of the relationship existing between the mesiobuccal cusp of the first permanent molar and the buccal groove of the first permanent molar. It is also necessary to be aware of the concept of occlusion and the entire classification provided by him. In case 3, sagittal relationship is Class III with a negative overjet, but the presence of deciduous molars and absence of upper permanent canines and some premolars led the vast majority of respondents to be inclined to rely on the molar ratios when providing an answer, classifying if sagittally as a Class I occlusal relationship. For case 4, in terms of the sagittal plane, a Class II malocclusion division 1 was expected as a diagnosis, based on Angle's system. In this particular case, a marked confusion was noted in distinguishing between a Class II Division 1 and a Class II Division 2 malocclusion. Another important feature in the sagittal-based classification is overjet. This feature was taken into account by <50% of the practitioners to make the occlusal diagnosis in the sagittal plane. According to data obtained solely for cases 2 and 4, in which overjet was significantly affected, these were described within the sagittal-based diagnosis. The same situation occurred with the vertical diagnosis for case 3, in which there was a high percentage of overbite description by respondents. This high rate of responses is due to the fact that, in this case, an anterior edge-to-edge bite is present. This is in contrast with case 1, for which no responses were obtained. One possible explanation for this situation is that in this case, dental study models with no alterations in the vertical plane are shown, causing all respondents to fail to mention this plane in relation to their diagnosis of alterations in this plane. 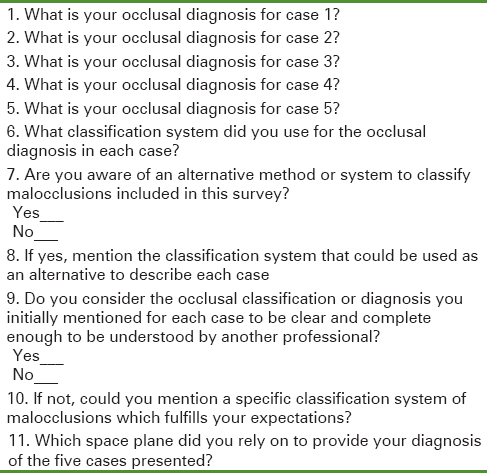 Concerning knowledge of classification systems for existing malocclusions, the research participants were asked in Section 7 whether they are aware of an alternative method or system for classifying malocclusions included in the questionnaire. Noteworthy, of the 49 people who answered affirmatively, 24% assumes the six keys of occlusion described by Andrews as a classification system of malocclusions, which is not accurate, because this author describes six significant characteristics found in 120 dental models of patients who had never had orthodontic treatment and had a normal occlusion. 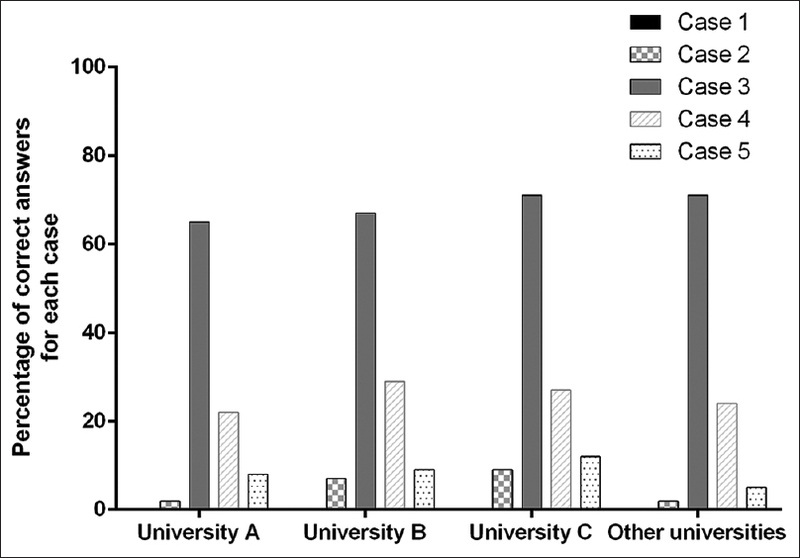 Despite this being a local study, part of the survey results shows how different classification systems are used both by general dentists and specialists as well as their differences by type of university where they studied. The most commonly used classification system is Angle's system among orthodontists and dentists; nonetheless, it is not applied correctly and could mislead to an incorrect diagnosis. We thank Doctor Andrea Pedroza Gárces who contributed with the study design during the beginning of the research. We thank the CONADI center for the financial support. The present study was funded by the CONADI center from Universidad Cooperativa de Colombia in Medellín. da Silva Filho OG, Ferrari Júnior FM, Aiello CA, Zopone N. Correction of posterior crossbite in the primary dentition. J Clin Pediatr Dent 2000;24:165-80. Defraia E, Marinelli A, Baroni G, Tollaro I. Dentoskeletal effects of a removable appliance for expansion of the maxillary arch: A postero-anterior cephalometric study. Eur J Orthod 2008;30:57-60. Mew JR. The postural basis of malocclusion: A philosophical overview. Am J Orthod Dentofacial Orthop 2004;126:729-38. Dewey M. Classification of malocclusion. Int J Orthodontia 1915;1:133-47. Angle's classification – Time to move on? J Orthod 2003;30:279. Angle EH. Classification of malocclusion. Dent Cosmos 1899;41:17. Du SQ, Rinchuse DJ, Zullo TG, Rinchuse DJ. Reliability of three methods of occlusion classification. Am J Orthod Dentofacial Orthop 1998;113:463-70. Case C. Dental oclusal classification of malocclusion. Int J Orthodontia 1920;6:33-51. Snyder R, Jerrold L. Black, white, or gray: Finding commonality on how orthodontists describe the areas between angle's molar classifications. Am J Orthod Dentofacial Orthop 2007;132:302-6. Katz MI. Angle classification revisited 1: Is current use reliable? Am J Orthod Dentofacial Orthop 1992;102:173-9. Katz MI. Angle classification revisited 2: A modified angle classification. Am J Orthod Dentofacial Orthop 1992;102:277-84. Lischer BE. The diagnosis of malocclusion. Dent Cosmos 1910;53:11. Dewey M. The classification of dento facial deformities. Int J Orthodontia 1915;1:133-47. Ackerman JL, Proffit WR. The characteristics of malocclusion: A modern approach to classification and diagnosis. Am J Orthod 1969;56:443-54. Bennett N. Report of the committtee on orthodontic classification. Oral Health 1912;2:321-7. Simon PW. Fundamental principles of a systematic diagnosis of dental anomalies (translated by B. E. Lischer). Int J Orthodontia Oral Surg Radiogr 1926;21:1084-90. Rinchuse DJ, Rinchuse DJ. Ambiguities of angle's classification. Angle Orthod 1989;59:295-8. Hellman M. Diagnosis in orthodontia and the method of technique I use in practice. Angle Orthod 1943;13:3-14. Bolton WA. The clinical application of a tooth size analysis. Am J Orthod 1962;48:26.